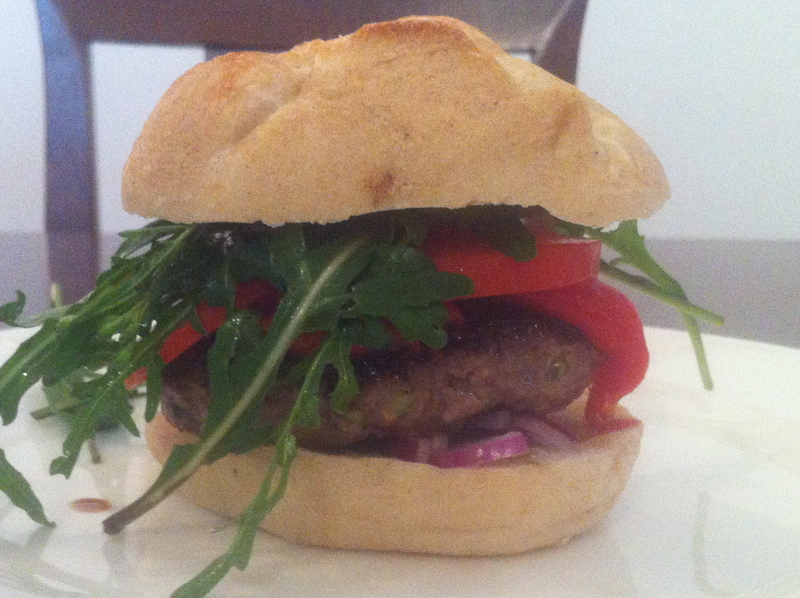 We love homemade burgers from our BBQ. Now with autumn living up to its promise of rainy days we have switched to burgers cooked in the pan. Thanks to the addition of grated courgette the burgers are succulent and very tasty. I made the peperonata in advance, from red peppers bought in bulk at the Friday market, and stored them in a jar covered with rapeseed oil. Sadly, I must say, they have all been eaten up. If I am lucky, I may get some more red peppers next Friday to make some peperonata to get me through – well, October, I guess. I placed the peppers, whole, on a rack in the oven and left them in at 200°C (fan) for an hour, turning them every now and again to make sure their skin gets black all over. When black all over, I took them out of the oven, placed them in a bowl and covered them with a plate. Once cooled down completely I rubbed off their skin and removed the seeds. This is fiddly work. Once peeled, place the peppers in a jar, cover with oil and store in the fridge until needed. Mix the minced beef, courgette with salt & pepper. Make four patties (make them quite flat as they will bulge up quite a bit during frying). Fry in a little oil for 7-10 minutes until cooked through. Serve with the buns, peperonata, tomatoes, onions and dressed rocket. I have been waiting for this one…..thank you! !